Wha daur say Mass in ma lug! Canada has a "raider" attitude. Stand Fast. Stand Firm. Die Hard. Regimental mottos and exhortations encouraging soldiers to hold to the last man. Much like the French Foreign Legions Camerone stand. The FFL is remarkable because it was a bunch of foreigners operating on foreign soil for a paycheque that held to their contract. That and personal honour. The other instances reflect groups of soldiers that not only held for honour but because they felt they had to defend their own people and their own turf. Their options were fewer and limited. Canada's army, by contrast, beyond the war of 1812, the Fenian Raids and the Riel Rebellions, has always had more in common with the French Foreign Legion than the Devons or the Middlesex. It only exists because the Brits left and Gladstone told Sir John A. to get on with it. The Brits weren't paying any more. In 1885 the Mounties needed a few more hands and the Government summoned up a bunch of volunteers. In 1914 another businessman hired a bunch of British ex-pats while the Government created an army out of similar "Canadians" for the duration. In 1949 in order to maintain diplomatic recognition the Government hired another group of temporary special service men to fight the good fight in Korea. Similar short term engagements in limited numbers have defined the actions of the Canadian Army to the present day - routinely with the Government relying on "volunteers" rather than regs and staying well away from anything that might suggest that the Government actually wants to commit Canadians to a fight. They will only commit so long as the supply of volunteers continues. No volunteers. No fight. The regs of today are a force in being of "volunteers". They are few in number. The Government would prefer that they not be seen in case a groundswell of new volunteers occurs creating pressure on the Government to use them and to finance them. Consequently the forces are geared, and accustomed to, a life of short, sharp strikes out of sight of the public. The definition of a raider force - more in common with Vikings and Sioux. Canada has a "raider" 'conflict tourism' attitude, at the political level. Marine Corps Systems Command recently released a request for information on innovative ideas for equipping LAR battalions with a mounted indirect-fires capability, beginning in fiscal 2022, that could hit targets at ranges out to 100 kilometers, said Jeff Nebel, fire support coordination team lead for Program Manager Fires. "We have identified a gap in the ability for LAR to provide indirect fire that extends further than their current capability," he said. "What we are looking to do is provide them with an organic indirect-fire capability that can reach out to extended ranges." The new capability would supplement the current 81mm mortars LAR companies use to support platoons operating forward, Nebel said. 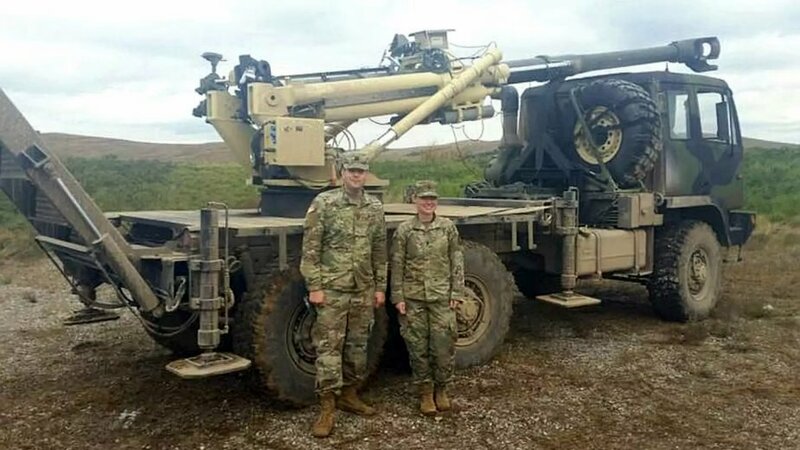 "This would give them the ability to provide support to the platoon at ranges significantly greater than ... what they can currently do with the 81mm mortars," he said. Let Cap Badge Battle Commence! WTF?? Ours are gate guards and tire rims. This is a coincidence, right? Nebel... as in 'Nebelwerfer' (Smoke Thrower, in German). More accurately--after all I am/was a lawyer--"Nebel" is fog; "Rauch" is smoke--so "Fog thrower". Sooo..... He's a lawyer too? I don't think Moaning Minnie translates into German. Canadian francophone battalions called them La Vache, as the sound of the incoming rounds resembled the sound a distressed cow in need of milking made. Dagny, this is not a battle over material goods. It's a moral crisis, the greatest the world has ever faced and the last. Our age is the climax of centuries of evil. We must put an end to it, once and for all, or perish - we, the men of the mind. It was our own guilt. We produced the wealth of the world - but we let our enemies write its moral code. “VULCANO” is a family of unguided (BER) and guided (GLR) ammunition for the 76mm, 127mm naval guns and 155mm land artillery systems. The VULCANO 155mm ammunition gives the 155/52 caliber and 155/39 caliber Howitzers the capability to extend their operative range and precision beyond the actual limits, minimizing engagement costs and collateral damages. VULCANO 155mm projectile is a sub-caliber, fin stabilized airframe, compatible with the use of standard modular charges, with no need of additional propulsion; it is loaded with Insensitive Explosive and Patented tungsten rings; the mechanical interfaces are the same as in standard 155mm ammunition. Guided Long Range (GLR) with canard control actuated by IMU + GPS guidance system for navigation (gliding trajectory )and possibility of terminal guidance (pull down) with optional Semi-Active-Laser (SAL). A Mission Planning Module allows exchanging data with the Fire Direction Centre for the management of the Firing Mission. Do I recall seeing a flatbed version of the LAV somewhere, sometime? We could work a deal to get these, about the right age for us. There may be a slight delay until they like us again. At least then we would have a semi-legitimate excuse not to buy a replacement. "Vulcano" sounds suspiciously like the Peenemunde Arrow Shell of WWII fame, which allowed the 28cm Krupp K-5 railway cannon to fire at targets 100 km away. The US Army and Navy are also looking at shells using the same form factor as the ones used in the electromagnetic rail gun. The advantage there is a full calibre shell which has a range of over 70km, or which can be used as an anti aircraft or anti missile round due to the flat trajectory and Mach 3+ velocity of the shell. The Peenemünde Arrow Shells were conceived and developed at the Aerodynamic Research Laboratories at Peenemünde from 1942 to 1945. The arrow shells were dart-like projectiles designed to be fired from special smooth-bore versions of standard German Army artillery pieces. The project was initially envisioned and designed as ultra-long-range shells using a 310mm smooth-bored version of the famed 280mm K5 railway gun (Anzio Annie). The arrow shell was 1.91m long and 120mm in caliber, with four fins at the tail 310mm across and a 310mm sabot or discarding ring around the middle of the shell (center of gravity). The ring was naturally discarded and would fell away outside the gun muzzle when fired, while the accelerating shell would reach a velocity of 1524m/sec and obtain a maximum range of 150km. Two guns were produced, and one of them fired in anger at the US 3rd Army located 125km away from the gun. There was an anti-aircraft version of the Peenemünde Arrow Shells. The projectile was designed for the 105mm FLAK 39 AA gun, with the goal to reach extremely high velocity so as to shorten flying time and eliminate the need to calculate aiming errors. The AA gunners would be able to aim, fire, and hit without having to worry about the speed of the aircraft and its altitude. During tests and experiments the shells obtained a muzzle velocity of 1067m/sec, which was considered excellent. Nevertheless, development had to be canceled since mass-production for combat use was impossible with the available production and industrial capacity of Germany. 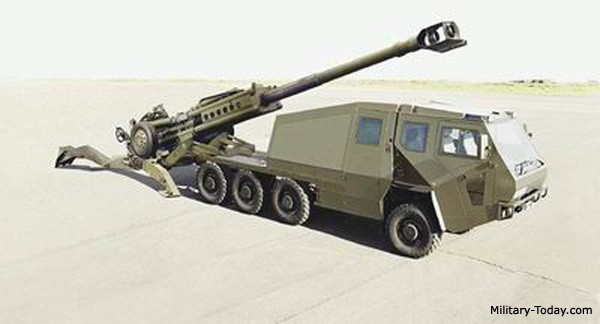 Of course to really take advantage of these capabilities would take an entirely new system, including a magazine feed (like the FH70 Archer), and a self propelled mounting with the ability to traverse and elevate the cannon at the sorts of speeds you get with a tank turret. A large on board ammunition stowage system would be nice as well. Since everyone will be shooting back at you the moment you unmask, a fully protected vehicle is really what is needed. Can you imagine if GDLS in London announced that it was selling LAV's to an "undisclosed Asian country." Heads would explode.